Let the ship sink into your taste buds..
Roast all the masala ingredients except cumin seeds. Cool and grind it adding cumin seeds. You can make this is larger quantity and store in an air tight container. It becomes very easy to make kootu if this powder is kept ready. Heat oil and add mustard seeds. When it splutters add the brinjals and dal and cook together adding required water. Add turmeric powder, salt and asafoetida. Grind the masala powder with grated coconut and little water and add it to the kootu. Mix well and in five minutes, it will start getting thick. This goes to the Food during Pregnancy event ..
Soak the dal for 2 hours and grind along with asafoetida, salt and red chillies and very less water. Heat 1 tsp oil and add this paste and cook for some time till it starts leaving the sides of the vessels. Cool and make small balls of it. Heat oil, add mustard seeds and when it splutters, add the tamarind juice, sambar powder, salt, asafoetida, curry leaves and turmeric powder. When it starts getting thick, add the balls made earlier and cook on sim for five minutes. If still watery, add paste of rice flour and cook for 2 more minutes. Mix the corn with mashed potatoes, salt, corn flour and turmeric. Make small balls of it and deep fry them. Test if the koftas start spreading in the oil. If so, add some more cornflour to it. Heat 1 tsp oil, add ginger, tomato puree, dry masala powders, salt and allow it to boil. Add some water to it and cook for five minutes. Add the koftas in the end just before serving. Garnish with finely chopped leaves. Corn Koftas ready to serve with hot rotis. 1) Powerless cooking event-This was the first event i hosted and the response was very good from my friends in the food blogging community. 2) Mava Mutter- Always used mava to make carrot halwa and never had tried any gravy item with mava. This recipe turned out to be a super side dish for rotis. 4) Cabbage Cashew Pakoda - From the time i stopped buying onions, i always used to wonder what other pakoda can i make and these cabbage cashew combination in pakoda worked out very well. 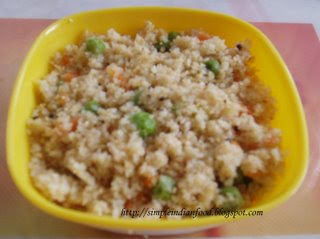 5) Vegetable Fried rice - My sister made this for us the first time and since then i am a fan of vegetable fried rice. Also it is a quick and nice option for those carrying lunch to office. 6) Special Ghee Roast Dosa - Had this for the first time in a hotel in Tirupati and it became an instant favourite. Check out its different style of presentation. 7) Almond Cashew Chikki - Always have tried chikkis with powdered almonds and groundnuts and it was the first time with almond cashew combination. 8) Amla (Nellikaai) Raita - A healthy raita introduced to me by my mother. 10) Vada Pav - Famous in Maharashtra and one of my all time favourite snack. 1) Cook healthy and eat healthy. Heat oil, add mustard. When it splutters, add green chillies, turmeric, curry leaves and boiled mashed potatoes. Add salt and cook for 2 minutes. Add lemon juice and finely chopped coriander leaves. Make balls of these. Make a thick batter of bengalgram flour, rice flour, salt, asafoetida and red chilli powder. Heat oil, dip the potato balls in the batter and deep fry till golden brown all over. Make a soft dough of rava, salt, maida, baking powder and water. Roll them into chapatis and use some round lid to cut small puris from it. Deep fry them till golden brown. Grind all the ingredients of green chutney together with some water. Strain and store. Boil all the ingredients of sweet chutney together to get a thick chutney. Make a hole in one side of the puri with a finger and fill half of it with boiled potatoes or green gram. Sprinkle some chat masala on it. Take a little green chutney and dilute it with some water and add sweet chutney to it. Serve. Heat 1 tsp ghee and sugar together without any water. Keep mixing well till the sugar melts. Switch off the gas and immediately add the chopped nuts. Mix well and transfer to a greased board (you could use the chapati stone)and roll out using the chapati pin to the required thickness. 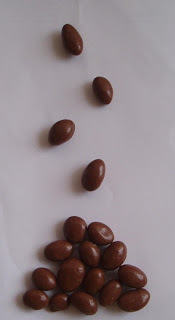 Cut into small squares using knife and slowly reverse the entire chikki. Cool and break into pieces as marked. Sending this to AFAM-Dryfruits hosted by the Yum blog. Roast the rava without oil for five minutes. Heat oil, add mustard seeds, bengalgram dal, blackgram dal and when it splutters add curry leaves and green chillies. Now add water and cooked vegetables. Add salt and ginger paste. When the water starts boiling, add the rava and cook covered for five minutes till the water is absorbed by the rava and you get a dry upma. Garnish with finely chopped coriander leaves. The procedure to make the main biscuit is same as the salted ones....however you need to prepare the dough without salt. Make a sugar syrup with 1 cup sugar and 1 tsp water. When the syrup becomes real thick and is full of bubbles, add these biscuits and mix well. Seperate them on a plate and allow it to cool. Yet another version is adding sugar to the dough itself and is popular as shankarpale... will post that later. Make a elastic dough of maida, salt and water. Leave it covered for five minutes. Roll them out into chapatis using rice flour. Cut them into small squares or diamond shapes and fry them in hot oil till light brown in colour. Cool and store in an air-tight container. You can even add some chilli powder to it if you like while making the dough. There are two more variations to this snack that will be posted later. 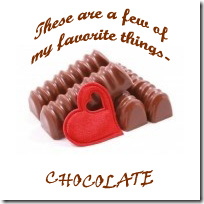 I have not made these chocolates, so no recipe.. The photo was taken in my Olympus camera model number U 410D. Sprinkle a little water on the palak after cleaning it and cook closed for 2 minutes. Allow it to cool and then grind to a fine paste. Heat oil, add the ginger paste, palak paste, turmeric powder, coriander seeds powder, cumin seeds powder and garam masala powder and a little water. Let it come to a boil. Add salt, cream and the paneer pieces to it. Cook for 2 minutes. Serve hot with rotis or puris. Cut the pav into half only on three sides and spread green chutney on one side and sweet chutney on other. Keep the vadas in between and serve hot. 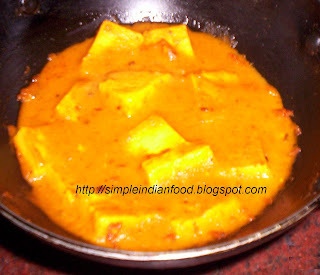 Cut the paneer into medium size pieces. Grind the tomato along with cinnamon, cardamom and cloves. Heat oil, add cumin seeds. Add the tomato paste, turmeric powder, red chilli powder and salt. Let it come to a boil.Add the paneer pieces, cream and butter and cook for 2 minutes. If the gravy is very thin, make a watery paste of 2 tsp rice flour or bengalgram flour and add it to the gravy. Cook for another minute and the gravy will start getting thick. Add more butter if your wish. Serve with hot pulkas or chapatis. Clean the methi and grind it in the mixie to get a coarse paste. Heat oil, add mustard seeds,bengalgram dal and blackgram dal. When it splutters, add the cashews, turmeric powder, peas, grinded methi and mix well. Add little water for the peas and methi to get cooked. Add salt, vangi bath powder, dry coconut powder, jaggery and mix well till it starts getting dry. Now add the cooked rice and mix well. Methi peas pulav ready in 10 minutes. My first post for the 'Food during Pregnancy' Event. Heat oil, add cumin seeds. (I have not used onions, if you would like to - you should add it at this stage and saute till it turns pinkish in colour). Add the tomato paste, ginger paste, turmeric powder, red chilli powder, pav bhaji masala powder, salt and 1/4 cup water. Allow it to cook for five minutes. Add finely chopped capsicum and mashed potatoes. Cook for two minutes, add butter and cook for another three minutes. Garnish with finely chopped coriander leaves. Toast the pav on both sides using butter as per taste. 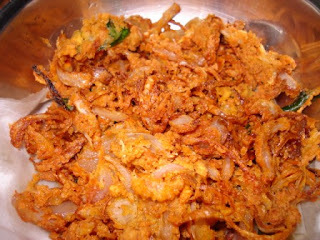 Serve pav and bhaji with a piece of lemon and finely chopped onions (optional). 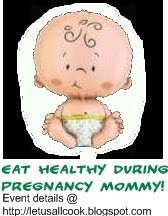 The present day working women has to satisfy her cravings for food during pregnancy by herself. This event is specially for such women who have to cook by themselves all the way till the delivery period. Your recipes could be anything from high protein salads, easy sandwiches, some pastes or readymixes which could be made and stored for a long time, healthy juices that would help you prepare a quick and easy meal. Please make something vegetarian, healthy, simple and quick not involving any kind of strainful activity. After posting, provide a link back to the event. This event starts today and ends of the 10th of January. I will post the round up during mid January. Send me your entries to easycrafts@gmail.com with subject as 'Food during Pregnancy' event and your name, blog name and link to the post. Non-bloggers can mail me their recipe with the photo. Feel free to use this logo for the post. Peel the skin of the raw bananas and using the slicer for chips, slice the bananas directly into hot oil. Add a little water to the salt and just before the raw bananas turn brown in colour, add a drop of the salted water to the oil. Once the sound settles down, transfer to a kitchen napkin and drain excess oil. Add black pepper powder and mix well. Tasty banana chips ready. Heat the ghee and add the vermicelli. Roast it till the colour starts changing. Transfer to a plate. Now heat oil, add mustard seeds, bengalgram dal and blackgram dal. When it splutters, add the green chillies, ginger paste and curry leaves. Add water and salt. When water starts boiling, add the roasted vermicelli and cook on low flame till done. 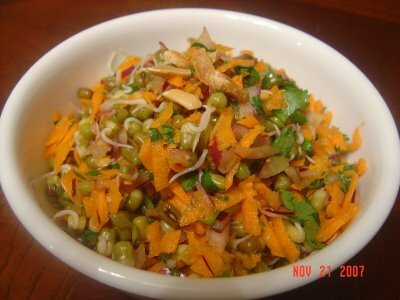 Serve by garnishing with finely chopped coriander leaves. Grind the coconut, green chilly, ginger, fried dal, asafoetida and salt to a coarse paste. Heat oil and add the mustard seeds and blackgram dal. When it splutters, add it to the chutney. Make a thick batter of all the ingredients except oil. Keep a big spoon having holes ready over hot oil and pour the batter on the spoon directly. You will get round balls of the batter in the oil. Fry them till the hissing sound stops and then strain excess oil on a kitchen tissue. Clean the aval and fry them in hot oil. Remove immediately and dont let them turn brown. Manakombu- Refer here for the recipe. Break these into smaller pieces. Fry curry leaves, corn flakes and groundnuts also in hot oil. Mix all of them, add more salt, asafoetida and red chilli powder as per taste. For encouraging and being a part of my first event “Power” less cooking. 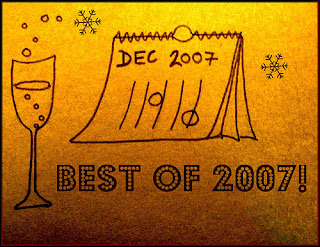 I am delighted to present the round up for this event as my 100th post on this blog. The dishes have been classified into categories – Main course/ Breakfast, Side Dish, Desserts and Snacks. Mix and match the posts to get your complete meal cooked without ‘Power’. 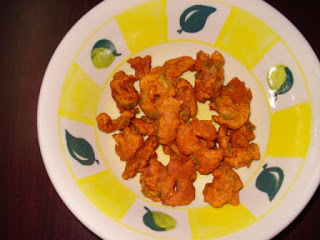 Srivalli of Cooking4allseasons blog presents Hot and Crispy Onion pakodas and Karela Pakodas. These don’t require any power appliance but will surely brighten up your spirits during rainy seasons and chilly winters.